Girl Scouts of Central California South are making a big difference with their cookie funds! Troop 2385 used a portion of their cookie sales to purchase food and drinks to donate to the Sweet Eats Program of Children’s Hospital Central California. The Sweet Eats Program is an organization that provides families of patients staying in the Craycroft Unit of the Children’s Hospital with free access to food and laundry services. The support of the Sweet Eats Program and donations from the community allow families to stay close to their children as they undergo treatment. The girls wheeled in wagons filled with food, drinks, and snacks and used the rest of their earnings to donate to the program. They also took an exciting tour of the unit, including the hospital classroom and playroom. Then the girls took it a step further and decided to write penpal notes to some of the children staying in the hospital. 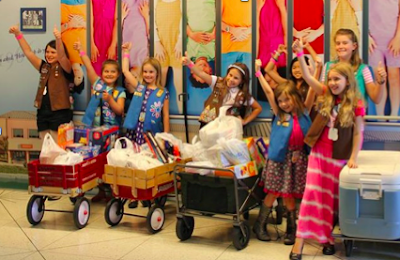 Troop 2385 prove to us that sweetness is a gesture that can be spread through many means, and that is exactly what they did!